Heritage Back to the Future was an ambitious intergenerational project that took place in the village of Clowne in Derbyshire, as a result of Orchestras Live’s strategic work with Bolsover District Council. 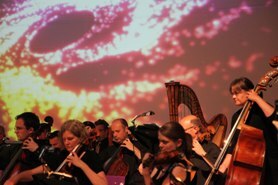 An artistic collaboration between the Hallé, Creative Forum and the people of Clowne, it culminated in two orchestral concerts at the newly rebuilt Heritage High School on 29 June 2011, where local young and older people performed alongside a 51 piece Hallé orchestra. Each concert featured a range of orchestral repertoire as well as the premiere of Heritage Back to the Future, a film and live soundtrack created during the project. ALEAtronic as a group have already produced a wide varitey of music, as is apparent from their debut album “First Take”.The group draw their inspiration from being exposed to a huge repertoire of classical music on a daily basis, being members of the Halle Orchestra, Manchester/UK. In addition to this ALEAtronic work extensively in the education sector with a wide variety of other musicians in schools and community workshop situations. ALEAtronic present a musical collage ranging from classical/experimental through to jazz and popular mainstream genres. From the inspiring Innocent World or the jazzy Snake to the tongue-in-cheek Imagination, there’s something for everyone here. On first take, ALEAtronic are delighted to have been working with vocalists Yvonne Shelton, Mancunian session/gospel singer, and Eric Troyer, late of ELO Part II, now a member of The Orchestra. The album has been engineered and mixed by Dennis York, sound engineer supreme.